Like most parents, I’ve missed certain things since having children. One of them is music. Music has always been a passion of mine: I’ve sung in choirs, a band, played the guitar and played with friends. Because I now keep more sensible hours, we no longer spontaneously play music together late into the nights. Because I have two children and am busy running a home, I rarely find time to listen to music in the day and when I have tried to do so in the past I have had to quickly stop an old music CD when I’ve realised that the lyrics may be inappropriate for children. I can listen to ‘adult’ music when the children are in bed of course, but that’s when I most crave quiet and time to process the day’s events. We’re big fans of Sesame Street in this household – I grew up watching it and the music on the show is fantastic – but even 3 Street CDs on repeat over 4 years can grind your musical ear down. I’ve picked up several other children’s CDs over the years and alternate these on a daily basis, but they just don’t cut it. Here’s the thing. I have sung to my children every day since before they were born. I did gigs while carrying them in my belly. They want to hear music – no, they need to hear music, and although they enjoy nursery rhymes, what they most want is real music. They have preferences of course – some of my strictly-vetted personal CDs have not passed my 3 year old’s audio test. 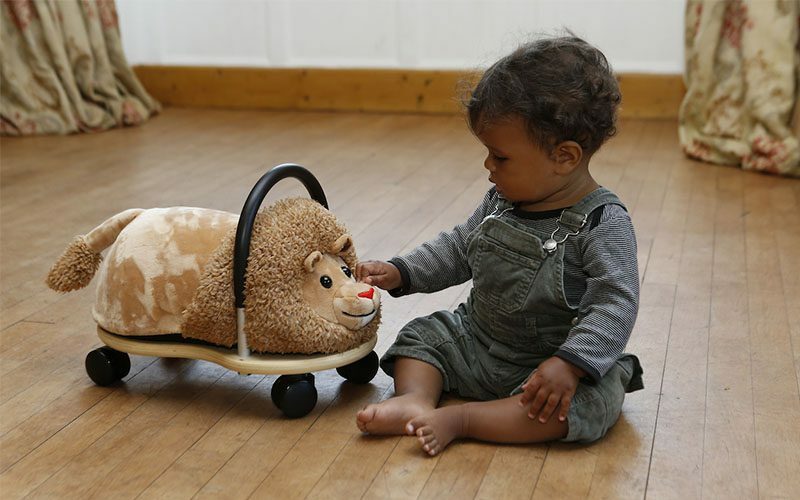 Repetitive, insanely-happy-toned nursery rhymes that require actions and baby ballet CDs have stood the test of time, but for parents they are some of the more grating numbers. Also, I’ve noticed a link between music that my children enjoy and music that makes them want to move in some way. They want to dance like the wild things they are. It is with relief then that I can announce that I’ve found music that appeals to us as a family, in all these ways. The artist is Poco Drom, and the theme is wildlife – but not as you know it! The main artist, Paul Fryer, blends stories about animals with catchy tunes and a fun approach. It’s light-hearted but it doesn’t underestimate the little listener. 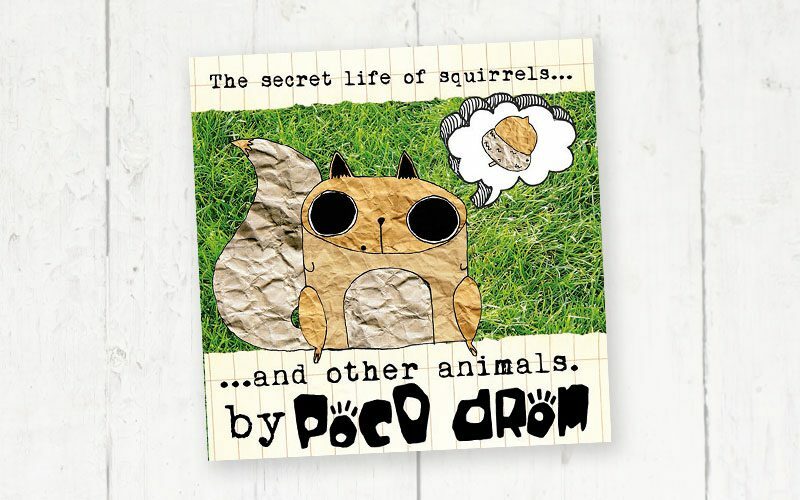 My daughter and toddler dance like crazy people to the tracks on the Poco Drom CD, The Secret Life of Squirrels… and Other Animals. They love them all, but the squirrel songs seem to be most popular. And I’ve noticed that since hearing the tracks ‘Squirrel Shakes the Tree’ and ‘Squirrel, Squirrel, Squirrel’ both of my children have developed a real fondness for the creatures. And goodness knows the grey squirrel is in dire need of some love! But now the squirrels have all these stories behind them – they eat nuts and climb trees, as Poco Drom’s song lyrics describe – but my almost-four-year-old also tells me longer tales about them, about what they get up to and where they sleep and so on. This music really does connect children to nature. And as an adult who has to listen to it several times a day, most days, I can attest to the fact that it’s wonderful for adult ears. I also admit to having a good old sing along at the, well, sing along sessions here in Exeter. (If you’re down this way, or in Bristol, you’re in for a treat as Poco Drom plays in both locations. Check it out. You’ll love them.) To say that the music is catchy is an understatement, but it’s not horribly catchy like pop tunes that are designed to sell themselves. When my children are in bed and I sit down at the end of the day to welcome the silence, I admit to hearing a bit of ‘Squirrel, squirrel, squirrel, With his bushy tail, And his furry feet, looking for nuts to eat,…’ in my head, but it brings up nice memories of my children dancing along to the music, my daughter’s stories about her new beloved animal friends, or whatever activity we were doing when the music was playing. The tracks share information about animals, but they don’t try overly hard to be ‘educational’, as Paul admits to making up some of the information in the lyrics. When he told me this I had to look up whether platypuses really do purr or not. (Apparently they do.) However, it’s educational in a natural way, in the way that all goods things are, because it sparks conversations amongst the children. Yes, I mean to write ‘the’ children, not ‘my’ children, because playing the CD has become a necessary requirement for whenever my children have their friends round. The CD is always an instant hit with the parents and the children, which has led me to point many of them in Poco Drom’s direction. there’s nothing more wild than a human child. Watching my children dance along to this CD, I’m inclined to agree. The Secret Life of Squirrels CD can be ordered online here as a digital album, a physical copy or as individual tracks. It features 10 tracks and is packaged in a plastic-free cardboard sleeve. Free Poco Drom tracks can be obtained here. 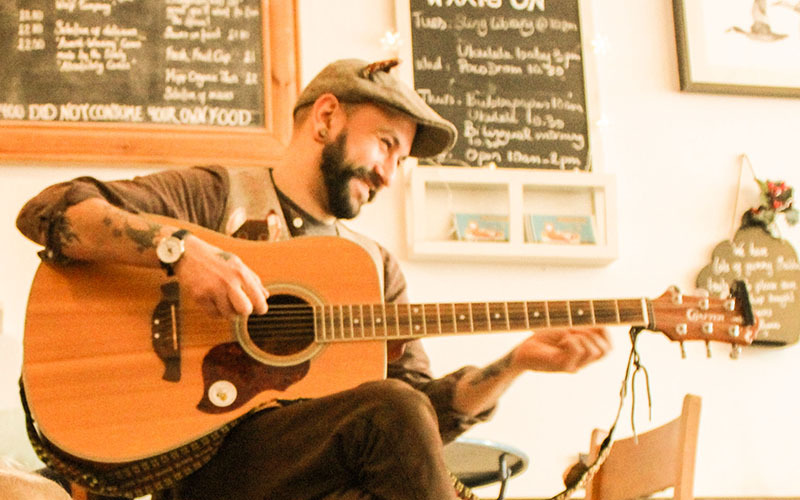 Poco Drom runs sing along sessions and ukelele workshops in Dawlish, Exeter and Bristol.